Men can benefit from the properties of Saw Palmetto for better prostate health. It is said to be helpful in treating many prostate disorders, including prostate enlargement and the discomforts of frequent urination. Saw Palmetto, as an overall tonic for good health, is very helpful for those who are convalescing or who suffer from wasting diseases, such as HIV/AIDS, and it is a known expectorant and an old folk remedy for bronchitis and asthma. Saw Palmetto is considered to be an aphrodisiac by many herbalists, for both men and women. Saw Palmetto has been administered to men to increase the function of the testicles and relieve irritation in mucous membranes, especially in the urinary tract and prostate. Clinical studies have suggested that Saw Palmetto can improve urinary flow rate and reduce nocturia in patients with benign prostatic hyperplasia. Saw Palmetto benefits for women, as it is said to support mammary gland health. It may also be helpful with polycystic ovarian disease, cystitis and help to decrease a hormone that stimulates male characteristics in women, called androgen. 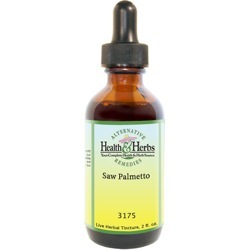 Saw Palmetto is an excellent diuretic and a urinary antiseptic. Saw Palmetto, as an expectorant, helps to clear the chest of congestion. It has been useful in treating bronchial complaints, such as coughs due to colds, asthma, and bronchitis, and it is particularly beneficial when there is an excessive discharge of mucus from the sinuses and nose. Saw Palmetto, a great overall tonic that builds strength during convalescence from an illness and has been helpful for those who suffer from wasting diseases, such as HIV/AIDS. Saw Palmetto, when used in diets, is said to stimulate the appetite and to have a beneficial effect on body weight. It is said to regulate hormones and is considered to be beneficial to the reproductive organs of both sexes and it is believed to be an aphrodisiac. It is said to improve the disposition, as it is thought to be a mild sedative and tranquilizer. Ingredients: Saw Palmetto Berry, Structured Water, 20% Alcohol. Non-Alcohol: Saw Palmetto Berry, Structured Water, Vegetable Glycerin. Contraindications: For men taking the prescription drugs Propecia® and Proscar®, you should al an ays inform their doctors if they are also taking Saw Palmetto. Saw Palmetto may counter the efficacy of Hormone Replacement Therapy (HRT) and birth control pills. Pregnant women should not use Saw Palmetto. It may have an additive anticoagulant effect and prolong bleeding time. Therefore, it is not wise to take with blood-thinning medication (aspirin, warfarin/Coumadin®, etc.) without first speaking with a physician.